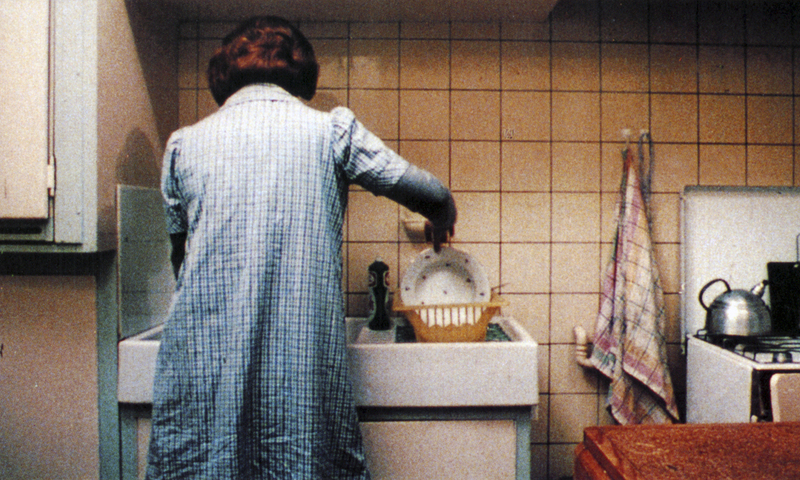 U of M Students Respond to "Jeanne Dielman, 23 Quai du Commerce, 1080 Bruxelles"
And Yet She Moves: Reviewing Feminist Cinema is a series co-organized by the Walker Art Center and the University of Minnesota. As a part of the collaboration, we will be using this blog as a venue for students to respond to and discuss the films . This post presents several viewpoints and responses to Jeanne Dielman, 23 Quai du Commerce, 1080 Bruxelles which screened on Sunday, November 13th. On the level of affect, the film is rare in its ability to foreground the bodily experience of the audience. In that way, the film is more like dance than film. In narrative film, time is often forgotten because of the pleasure or immersive quality of the cinema. Ivone Margulies, in the Criterion notes to the film, said, “the viewer becomes aware of his/her own body, restless and then again interested.” Alongside Jeanne Dielman’s work onscreen, I began thinking about the work I do in everyday life, the work mothers do, the ways I am indifferent to the work of others. The film confronts the “ultimate challenge” Laura Mulvey set out in “Visual Pleasure and Narrative Cinema,” which is “how to fight the unconscious structured like a language…while still caught within the language of the patriarchy.” In the scenes between Jeanne Dielman and her son, long stretches of non-verbal communication structure the choreography of their exchange. Here we see Mulvey’s problem inverted: language structured like the unconscious: typical family behavior. During the post-screening discussion, one audience member declared the film to be anti-humanist, and another argued for Jeanne Dielman to be considered as a non-person. I am not sure I agree with either of those statements. Like Henri Lefebvre’s Critique of Everyday Life, Akerman seems to be showing that while alienation is constant and everyday, “genuine changes” also “take place…in the unmysterious depths of everyday life.” The seven final minutes of the film alone express Jeanne Dielman radical personhood. While there is mystery in Delphine Seyrig’s masterful performance, there is something utterly ordinary about the way she sits at the table with a bloody hand, breathing in and out all of her own disequilibrium in that duration. Akerman’s avoidance of sensationalism, of voyeurism, the ways she preserves Jeanne Dielman’s subjectivity intact, is feminist and humanist. This film is beyond brilliant and if you missed it, you are lucky: this is the most widely-available of all the films in the And Yet She Moves series. Despite the film’s ability to cause “perceptual oscillation” for the viewer (according to Marguiles), I was surprised at how short the three and a half hours felt. As the house lights went up, I was thinking about how I wanted to watch it again. With the film’s opening revealing titles and credits—text on a black background—we first hear, rather than see, the world of Chantal Akerman’s title character in Jeanne Dielman, 23 Quai du Commerce, 1080 Bruxelles. The hissing of her gas stove breaks into the silence. Likewise, the close of the film mirrors the beginning, with the sounds of the Quai du Commerce intruding on Jeanne’s life and lingering with the fade to black in the end credits. These moments of transition serve as more than just a clue of the realities of the main character’s life; rather, they illustrate her transformation. From housewife to liberated woman? Murderess? On the lam? As Professor Rabinowitz stated in her post-film lecture, the end (the murder) is not the end point and, in a way, is unimportant. The sound transitions to and from the titles underscore this notion and state, rather bluntly, that Jeanne no longer is rooted firmly in the domestic, but has made a break from this routine and lifestyle. The actions, not the motivation, constitute the focus of attention and do not finish with the murder, but continue beyond that moment and, indeed, beyond the scene where Jeanne sits in the dining room. Akerman’s film does not portray a woman coming undone, but rather a destruction of a routine that has kept her captive. The murder, though perhaps momentarily shocking, comes as no surprise. Jeanne’s world slowly unravels, interrupting her routine and our watching. The expansion of Akerman’s movie time encourages and allows the viewer close observation. By expanding scenes to watch Jeanne begin and complete a task, the viewer becomes inducted into her routine and the specific actions surrounding tasks. In day one, we receive the ideal of how she ought carry out her tasks and interactions. The second day begins with an unsettling moment—with the chair being harshly pushed in after shining Sylvain’s shoes. Where such a mundane action would normally not register with a film viewer, the contrast with her previous carefulness with such an action is jarring enough to make us jump as if she lit a firecracker. These moments of domestic dissonance with the standard routine accumulate: the potatoes cook too long; her hair remains unkempt after her visitor; she fails to greet her son at the door upon his arrival home. This disruption in behavior extends to the framing and editing. With a closer look at the dinner scene on the second day, Jeanne leaves the dining room, and, in typical fashion, the scene changes to the hallway, but instead of cutting to follow Jeanne into the kitchen to watch her fill the plate for the next course, the camera remains in the hallway, denying the expected continuity and, I would argue, emulating for the audience the restlessness and disruption of the main character. 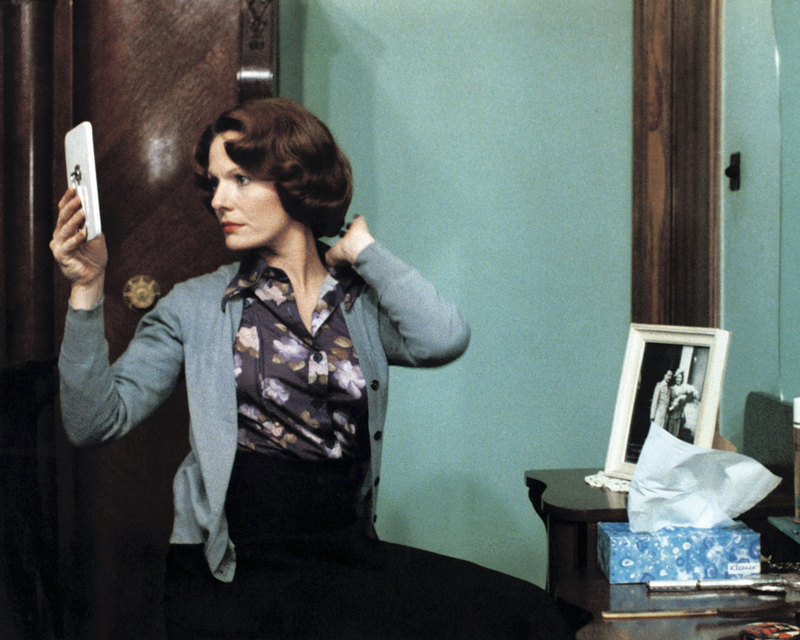 As mentioned during the post-film discussion, Delphine Seyrig’s hair was dyed to match the woodwork in order to help the character of Jeanne more completely blend into the domestic space. When looking at her costumes as unchanging and tied to specific actions, we see how these further serve to codify her activities and how tied to responding to her environments Akerman’s character is. Through this costuming, we can read a continuum of disruption in Jeanne’s life. After being accustomed to the proper manner of dress, an out-of-place button forces a comment by her son. In the final scene, the small amount of blood on an otherwise perfect, white blouse does not surprise because of that button and the mussed hair on the previous day; they prepare us for her change in behavior. As she sits at the table after the murder, neon light flashes in a pattern across Dielman’s face, as it has throughout the film. She is still part of the same sphere, now a space transformed. In a film where looking forces us to focus on the mundane and habitual activities of housewives, it leaves us with one of the film’s longest shots to contemplate with the character the dissolution of a woman’s work and how she can regain personal identity and agency in making a break (accidental or intentional) with the menace of the routine. Jeanne wears a heavy, blue robe in the morning; a light, patterned housecoat for housework and cooking; a black skirt and grey sweater over an unremarkable blouse for down time and white; and functional undergarments for her professional entertaining and sleeping. I think that it is interesting, as Nicole discussed above, that the film Jeanne Dielman depicts the unraveling of a woman’s routine, because it seems that it simultaneously builds a cinematic language based on a new time signature—that of the time of Jeanne Dielman’s daily activities. Jeanne Dielman, the film, seems as methodical and measured as Jeanne Dielman, the character. Jeanne Dielman, the character, is constituted by her careful and precise domestic labor depicted in the film. In one scene, we watch her bread thin slice of meat, a process that we learn occurs in three stages: flouring the meat, dipping the meat in egg, and then dipping the meat in breading. Dielman wastes nothing—we learn that the meals for the week are set ahead of time in order to reuse ingredients from the previous day, and that Dielman wastes no time in her preparation method. Likewise, Akerman wastes no time in these scenes, instead we are reoriented to the time of breading meat, a time that we quickly learn always includes washing dishes and wiping off the table. At some points these lessons in food preparation seem excruciatingly boring and almost terrifying in their power to co-opt the audience member’s time. But at other times, this imposition of structure allows for an exploration of the pleasure of boredom. Because this is a filmic time that wastes nothing but also omits nothing, the viewer is able to sink into Dielman’s routines and experience the comfort of boredom.